The topic of faceted navigation is bound to come up at some point in your SEO career. It's a common solution to product filtering for e-commerce sites, but managing it on the SEO side can quickly spin out of control with the potential to cause indexing bloat and crawl errors. 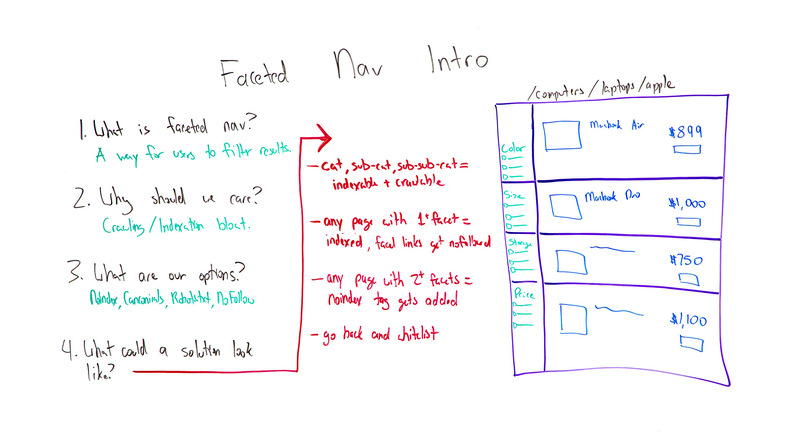 In this week's Whiteboard Friday, we welcome our friend Sergey Stefoglo to give us a quick refresher on just what faceted nav is and why it matters, then dive into a few key solutions that can help you tame it. Hey, Moz fans. My name is Serge. I'm from Distilled. I work at the Seattle office as a consultant. For those of you that don't know about Distilled, we're a full-service digital marketing agency specializing in SEO, but have branched out since to work on all sorts of things like content, PR, and recently a split testing tool, ODN. Today I'm here to talk to you guys about faceted navigation, just the basics. We have a few minutes today, so I'm just going to cover kind of the 101 version of this. But essentially we're going to go through what the definition is, why we should care as SEOs, why it's important, what are some options we have with this, and then also what a solution could look like. 1. What is faceted navigation? For those that don't know, faceted navigation is essentially something like this, probably a lot nicer than this to be honest. But it's essentially a page that allows you to filter down or allows a user to filter down based on what they're looking for. So this is an example we have here of a list of products on a page that sells laptops, Apple laptops in this case. Right here on the left side, in the green, we have a bunch of facets. Essentially, if you're a user and you're going in here, you could look at the size of the screen you might want. You could look at the price of the laptop, etc. That's what faceted navigation is. Previously, when I worked at my previous agency, I worked on a lot of local SEO things, not really e-commerce, big-scale websites, so I didn't run into this issue often. I actually didn't even know it was a thing until I started at Distilled. So this might be interesting for you even if it doesn't apply at the moment. 2. Why does faceted navigation matter? 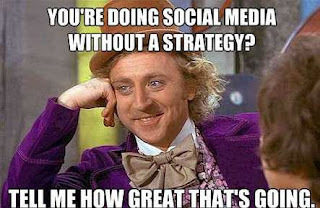 Essentially, we should care as SEOs because this can get out of control really quickly. While being very useful to users, obviously it's helpful to be able to filter down to the specific thing you want. this could get kind of ridiculous for Googlebot. We've had clients at Distilled that come to us that are e-commerce brands that have millions of pages in the index being crawled that really shouldn't be. They don't bring any value to the site, any revenue, etc. The main reason we should care is because we want to avoid indexation bloat and kind of crawl errors or issues. 3. What options do we have when it comes to controlling which pages are indexed/crawled? The third thing we'll talk about is what are some options we have in terms of controlling some of that, so controlling whether a page gets indexed or crawled, etc. I'm not going to get into the specifics of each of these today, but I have a blog post on this topic that we'll link to at the bottom. The main, most common options that we have for controlling this kind of thing would be around no indexing a page and stopping Google from indexing it, using canonical tags to choose a page that's essentially the canonical version, using a disallow rule in robots.txt to stop Google from crawling a certain part of the site, or using the nofollow meta directive as well. Those are some of the most common options. Again, we're not going to go into the nitty-gritty of each one. They each have their kind of pros and cons, so you can research that for yourselves. 4. What could a solution look like? So okay, we know all of this. What could be an ideal solution? Before I jump into this, I don't want you guys to run in to your bosses and say, "This is what we need to do." Please, please do your research beforehand because it's going to vary a lot based on your site. Based on the dev resources you have, you might have to get scrappy with it. Also, do some keyword research mainly around the long tail. There are a lot of instances where you could and might want to have three or four facets indexed. So again, a huge caveat: this isn't the end-all be-all solution. It's something that we've recommended at times, when appropriate, to clients. So let's jump into what an ideal solution, or not ideal solution, a possible solution could look like. What we're looking at here is we're going to have our category, subcategory, and sub-subcategory pages open to indexation and open to being crawled. In our example here, that would be this page, so /computers/laptops/apple. Perfectly fine. People are probably searching for Apple laptops. In fact, I know they are. The second step here is any page that has one facet selected, so for example, if I was on this page and I wanted an Apple laptop with a solid state drive in it, I would select that from these options. Those are fine to be indexed. But any time you have one or more facets selected, we want to make sure to nofollow all of these internal links pointing to other facets, essentially to stop link equity from being wasted and to stop Google from wasting time crawling those pages. Then, past that point, if a user selects two or more facets, so if I was interested in an Apple laptop with a solid state hard drive that was in the $1,000 price range for example, the chances of there being a lot of search volume for an Apple laptop for $1,000 with a solid state drive is pretty low. So what we want to do here is add a noindex tag to those two-plus facet options, and that will again help us control crawl bloat and indexation bloat. The final thing I want to mention here, I touched on it a little bit earlier. But essentially, if you're doing this after the fact, after the faceted navigation is already set up, which you probably are, it's worth, again, having a strong think about where there is keyword search volume. If you do this, it's worth also taking a look back a few months in to see the impact and also see if there's anything you might want to whitelist. There might be a certain set of facets that do have search volume, so you might want to throw them back into the index. It's worth taking a look at that. That's what faceted navigation is as a quick intro. Thank you for watching. I'd be really interested to hear what you guys think in the comments. Again, like I said, there isn't a one-size-fits-all solution. So I'd be really interested to hear what's worked for you, or if you have any questions, please ask them below.